Lieutenant Michael A. Young graduated from Springfield Shawnee High School in 1991. He graduated from Clark State Community College in 1994 with an Associates Degree in Criminal Justice. 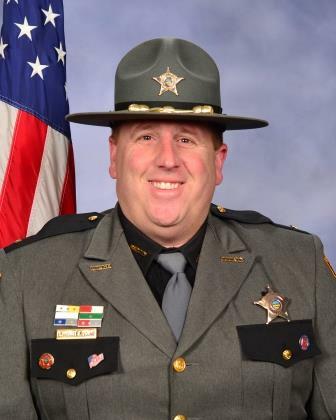 Lt. Young completed the Ohio Peace Officers Training Academy at Clark State in 1995 and began service with the Clark County Sheriff’s Office as a special deputy until he was hired full time in December 1996. In 2004, he obtained a Bachelor Degree from Wittenberg University in Liberal Arts Degree with a concentration in Organizational Leadership. He also served in the Army National Guard and received an Honorable Discharge in 1998. During his career, Lt. Young has served in the Jail Division, Uniform Patrol Division, Mad River Township Community Oriented Policing, Environmental Enforcement, and SORN. Lt. Young has received numerous accommodations including the Sheriff’s Award, Perfect Attendance, several meritorious Service Awards, Medal of Valor, and many letters of appreciation from citizens. He has served as the Jail Administrator since July 2015. He is a graduate of the 21st class of Executive Excellence training with the National Institute of Corrections in Aurora, Colorado and has attended several jail administrator trainings throughout the state of Ohio. Lt. Young has 3 boys-Zack, Jacob, and Lucas. He has a demonstrated commitment to Clark County. He has attended the Clark County Leadership Academy, coached high school athletics at Southeastern, Shawnee and Greenon High Schools. He has helped in organizing the Corporate Challenge, served as CIT training coordinator and served on Catholic Central’s athletic boosters. He is a member of the FOP, Knights of Columbus 624, Elks Lodge #51. In 2005, he received the United States Police Softball Sportsman of the Year for organizing a hospital visit to Dayton Children’s Hospital with several officers from all over the United States. He played in the Ohio Police & Fire Olympics, and also won two silver medals at the International Police & Fire Games in Cocoa Beach Florida in 2000. He played for the Columbus Marauders of the Public Safety Football League for 6 years.